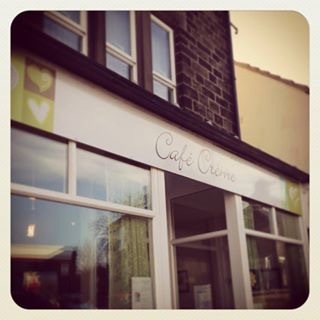 Cafe Creme is a family run business based on the High Street in the market town of Penistone. Homemade food; Breakfasts, Sandwiches, Panini’s and Toasties, Hot Dishes of the Day and of course a great selection of Homemade Cakes and Freshly ground Coffee and Teas. The majority of our dishes and all of our cakes are available as Gluten and Wheat free with plenty of Dairy free available too. All our food is available as a take-out or sit in, in one of our 2 seated areas. Seating is available for 35 people. We feel passionate about our food, its all homemade, and as much as we can we use locally sourced products, our meat and sausages come from Paul Schofield, a great butcher based in the centre of Penistone. The teacakes (or baps or breadcakes depending where you are from) are from Cottage Bakery based in Silkstone Common… Cakes are all lovingly made by us in house. ©2019 Cafe Creme Penistone. All Rights Reserved. Bakes and Cakes by Rara Theme. Powered by WordPress.